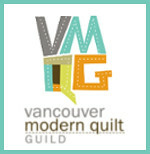 Quiltmaker’s 100 Blocks Volume 5 Blog tour! Hey everyone! Welcome! Wilkommen, Bienvenue, Anyeung He Casayo, Hola! Are you as excited as I am to see what treats are in store in this new issue chock full of pattern goodness? Oh did I have fun with this one! As usual, it’s paper pieced, and all of the facial details are embroidered with a double strand. 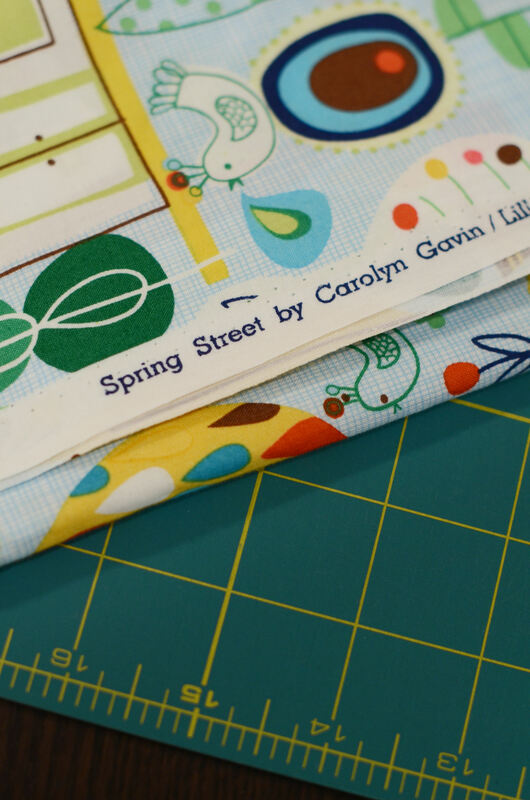 I designed their tummys to be a great spot to showcase your favorite prints, and I fussy cut some of my favorite elements from Spring Street from P&B textiles. I also used my favorite Quilter’s Linen and Kona by Robert Kaufmann. ….her teenaged daughter, who reminds me of my niece..
…and the little sister who is quite mischievous despite that innocent smile.. There is this amazing stuff called Glad Press n’ Seal which you can stick and peel off of virtually anything several times. It’s perfect for tracing embroidery elements. I love how you can so easily position it exactly where you need it. I separated all the floss I used down to two strands. And grabbed my trusty embroidery hoop.. I went with a simple back stitch to outline everything..
And a satin stitch (just over the outside of the outline, and just to the inside of the inner line) to fill in the lips..
And again I used a back stitch for the black smile line.. When you’re done, just gently tear away the press n’ seal. Sometimes I need to use some tweezers. 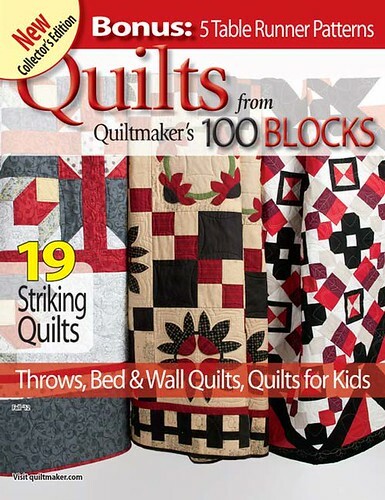 So if you would love to win a copy of Quiltmaker’s 100 Blocks Volume 5, leave me a comment below , make sure I have some way of contacting you! and I’ll choose a winner on May 3rd! Comments are closed and the winner will be announced shortly! Good luck! And enjoy the rest of the blog tour! ← Make it, Earth Day and Modern LAQ. How sweet! This little family are utterly adorable! I would love a copy of this magazine- it is unavailable here in Australia, as far as I know! Thanks for the giveaway! Great block! Thanks for the tip on the glad press and seal! Love the block and the great tip on the press n seal! i hadn’t thought to do that before and don’t really like to use pencil or blue marker. i would really love to win a copy of the 100 Blocks! These are so cute! I’m pretty excited about this issue, I’m working on 2 designs from volume 2 at the moment. Great art work. very nice! I love their eyes and smiles, and your fussy cut bodies definitely make great use of the fabric. Another fabulous design Sonja! Love the cute design! The press n seal is such a smart idea. I’ll have to try it. 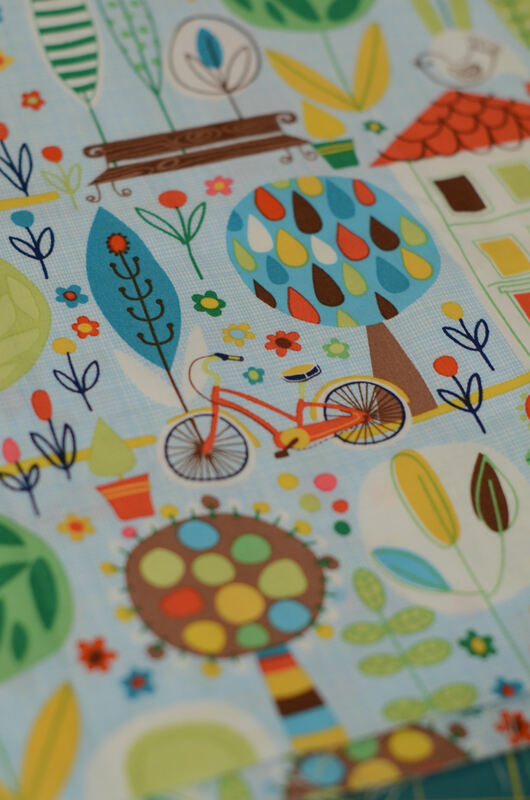 Love the spring street fabric. Lovely design and brilliant tip – not sure we have that product in the UK but there may be an alternative. What a darling block. You are so talented! Great design!! Wish I had your talent. Congratulations! I love how your name is at the top of the list on the magazine cover! Hooray! I love, love, love, love your doll design!!! The press and seal was a brilliant idea! As usual, your fabric choice is simply divine! This pattern is a must have! I love your patterns. Thank you so much for the chance to win! I love your use of glad press and seal, so easy and clever! Super cute!!! I would love to win a copy! 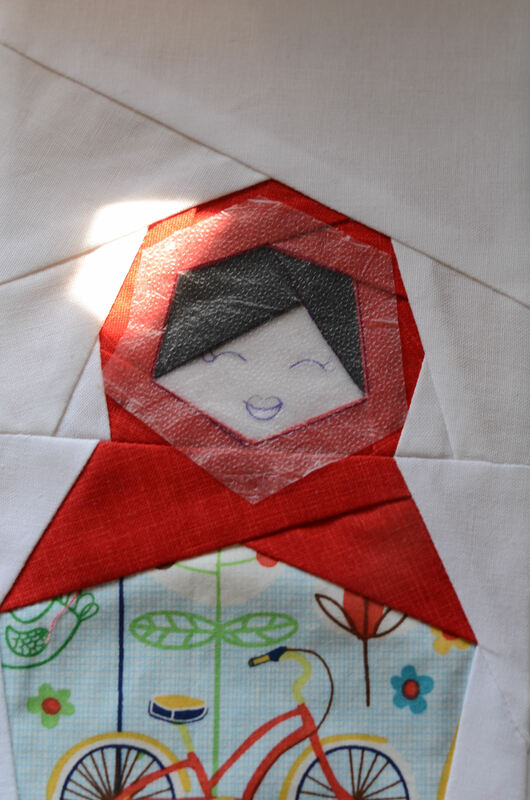 I love the “Lil’ Matryoshka” pattern 🙂 there is just so many things that you can do with it. They are fantastic and I never would have thought Press n’ Seal would be used in such an ingenious way! Would love to win a copy of the magazine. Hi Sonja! I found you through Sewhooked and I love your designs. I’m an avid embroideress and and never would have thought of Press n’ Seal for transferring designs. What an excellent tip and a beautiful block. Very cute block. Super amazing embroidery tutorial!!! I would love a chance to win this – i have really wanted a copy! Love your block. Thanks for the tutorial on Press n’ Seal. I’ll start looking for it in my local grocery store. Thanks for the chance to win. Cute little nesting dolls! And I love their expressions! Great use of Press ‘n Seal. Thanks for a chance to win a copy of the QMs 100 Blocks #5. Wow! Another fabulous pattern! 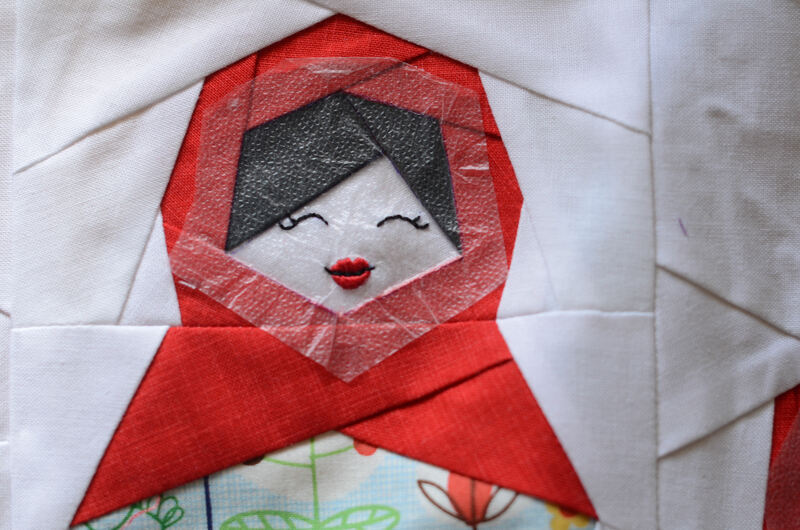 You must have a quilting fairy that helps you come up with ideas and patterns!! I love it! Off to buy some Press n’ Seal! LOL! The tip about the press’n’seal is worth its weight in gold! Thanks!! Your block is darling and how interesting to use that plastic! I’m fascinated! This is such an awesome block – when Jennifer Ofenstein posted about her block (also on the cover! ), I was immediately drawn to the Matryoshka dolls! SO cute. I don’t know where I’ll find this magazine (I live in Calgary, but I’ve never seen it anywhere around, although I don’t often look through the quilting magazines.. maybe Chapters), but I’m definitely going to have to get a hold of it. You are so creative and talented! Thanks for sharing your thread and fabric ideas. And for a chance to win the book! As always I love your new design, they have such personality. Thanks for sharing it hot off the presses! very cute! i’d love a chance thanks! I’ve meant to get a copy of every single one of these volumes and so far I have ZERO! I would love to win. 🙂 The little faces you made are so cute! What a wonderful design! Thank you for sharing and giving us a chance to win. not only is this my new favourite block, but the press n’ seal trick is pure genius!! Your matryoshkkas are just adorable of course; I love the faces you chose to give them! I’d never heard the tip about the press ‘n’ seal before, thank you! These are so sweet! Love how you positioned the fabric and thanks for the press ‘n seal tip.I just happen to have some in the kitchen. I’ve used other producst such as Solvy’s sticky stuff but it’s heavy. I’ll have to give this a try. I love your dolls and how you gave each one personality! Fabulous tip, cool giveaway. Thanks for the chance. 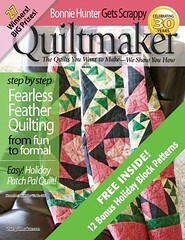 love to win the Quiltmaker’s vol. 5. Thanks for the chance to win! Eeeek! Your block is awesome, and, as you say, full of possibilities. And thanks so much for the tutorial on using Press n Seal. It never would have occurred to me! My first visit here, but I’ll be back. Wow would love to have a go at making these, I have only just started paper piecing and it’s not as hard as I first thought!! Congratulations on being included in the 100 Blocks issue! Cute, cute block. Your advice about the Press-n-Seal is great–I’d never heard it and can’t wait to give that a try. I have some old Alexander Henry matryoshka fabric that would make an awesome border for a little quilt from your design. Thanks for the giveaway. Your blocks are always so creative and over-the-top cute! Glad to see another one in this volume of 100 Blocks. What a wonderful tip about using Press and Seal on stuff for embroidery! Definitely a trick I will use! Thanks for the chance to possibly win a copy of 100 Blocks! Can’t wait to get my hands on a copy of Volume 5!! I love your Press n Seal idea for embroidery as I love to embellish everything!! Cute little doll block!! 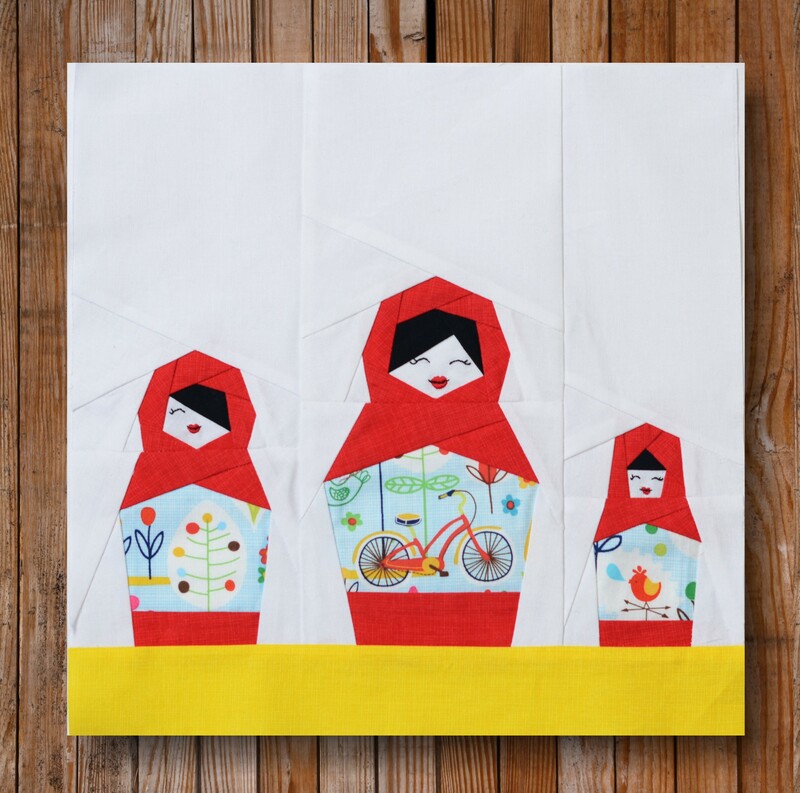 A quilt out of paper pieced nesting dolls – what a wonderful idea! Love the Glad Press N Seal idea as well. Thank you for this block and the awesome press and seal tip, never would have thought of that! I found you recently through sewhooked’s garden party blog tour. Congrats on 100 blocks and I’m so looking forward to this issue! Can’t wait for Volume #5! I already know exactly what I’ll make with this block. My mother has a Matryoshka doll collection that she added to when my grandmother passed this Feb. I’m going to go buy some of that paper as well. I spent way too much time trying to pull paper pieces off of some baby cowgirl boots the other day after embroidering bluebonnets. Sweet block! A great tip on the press n seal for embroidery. Love your block! Thanks for the tip on doing the embroidery details–will be looking for some Press n Seal next time I’m in the store. Thanks for the chance to win! Awesome! What cute little ladies! Thanks for the wonderful tutorial on using Glad Press & Seal. Love their smiles the best! What a great tip about the Press and Seal, thank you, I’m going to try it. Cute block and great tip with the Press and Seal. Have just started doing some hand embroidery and will try this on my next project. I love the block. It means I will have to try paper piecing finally. The tip about press and seal is also appreciated. Thanks so much. Thanks for the wonderful tutorial. CUTE block! Wonderful block! My daughter still likes the Matryoshkas and she is ……., well, not a child any more! I love this block! What a great embroidery tip! What an adorable block. Thanks. Such a cute block. Thanks for the chance to win. Your quilt block is just darling! 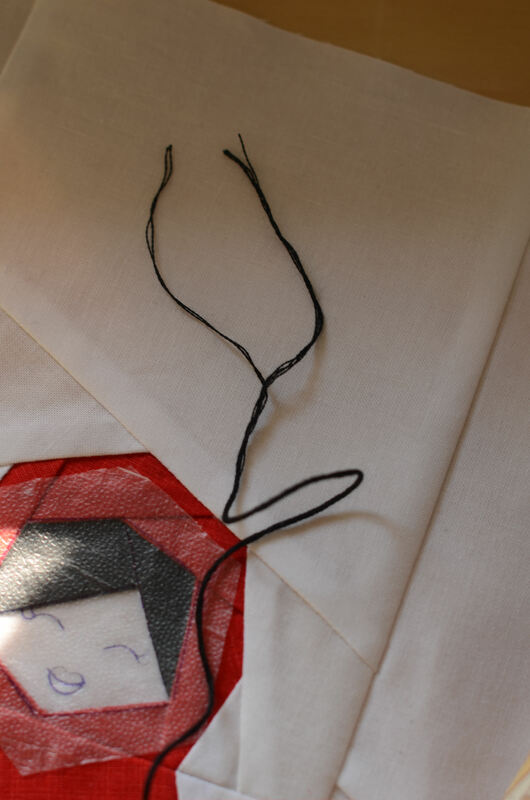 Thanks for the tip about tracing embroidery onto freezer paper.. very handy! This block brings back childhood memories. Great tip on using the press and seal – I am going to put this on my shopping list. Thanks for a chance. OMG I love that block!! I have tons of girlies in this family and that would make a gorgeous quilty!! Thanks for sharing. Cute block! I’d love to win your giveaway! Great block. Thanks for showing how you did the embroidery on the faces. You made it look easy. such a cool block, love to embroidery on anything, thanks . Darling block, I also love press and seal. Thanks for the giveaway. Congratulations on being in the magazine. You must be very excited. Thanks for the chance to win a copy. Thanks also for showing how to use the press and seal. I had heard about people using it in different parts of quilting etc but now I know how to use it for embroidery. WIll put it on my shopping list. Not sure if my comment made it in. Love the block, especially the teenage daughter’s hairdo. Press and Seal is totally on hand and I’m excited to try it, thanks! Cute blocks! Thanks for the instructions and for the tip about the press n seal. Congratulations on being in the magazine. Thank you for the chance to win. Such an adorable block!!! Thanks “sew much” for this chance to win! Your facial detail is amaing! Great idea with the press and seal! Thanks for the great ideas! Great idea for press & seal! What a wonderful tip about the Press and Seal! I love the faces you created – such personality conveyed in just a little bit of thread! What an incredible block! Paper piecing intimidates me, but I am very new to quilting. Someday! Thank you for the chance to win this great book! Your block is ADORABLE!!! Thanks for sharing that awesome tip about the press and seal! Thanks for the press n seal tip. What a great idea. I will definitely be trying it out. Thanks for having this giveaway. That is interesting to see how you did that. Thanks for all the detail! Very informative! Love your block and especially the face. And thanks for the tip! I will definitely use it. What a fun block and so many possibilities by using different fabrics for the clothes. OMG, these blocks are adorable! thanks for sharing that great tip as well! What a cute block! Thanks for the embroidery instructions. Love it! Love it! That is so cute. Thanks for the chance to win. I love your dolls. Can’t wait for the magazine to play with them. How sweet is that?! 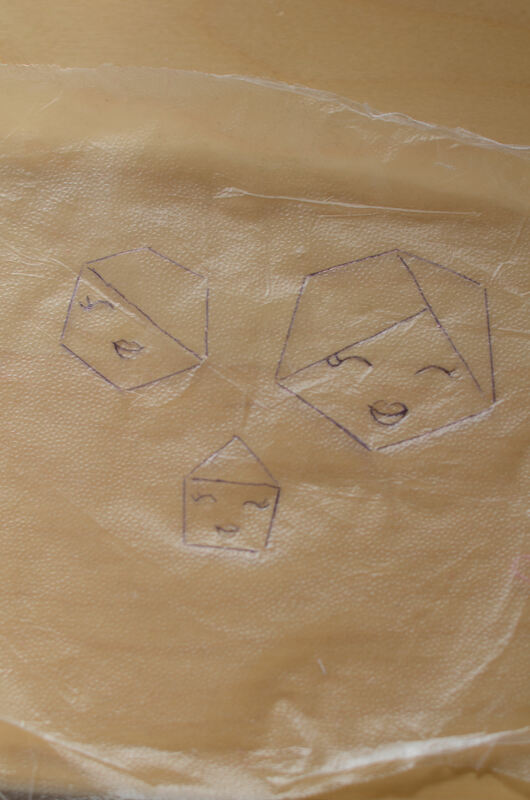 thanks for showing how to stitch the faces and bring them to life. =) adorable..
What a super idea using the press & seal!! And how cute is this block?! Thanks for the chance! I love your nesting dolls. I have a couple of the dolls and quite a collection of the nesting santas. Whenever I see one, I have to have it. I Can’t wait to make these and use my oriental prints. Would love to win the magazine. Congratulations on getting your block into the book. You must be some excited. I really appreciate the new way to position embroidery. I get together with my quilty friends on Wednesday and I can not wait to share it with them!! Thanks for the chance to win!! What a great blog you have! I am enjoying this 100 Block blog tour. Thank you! What a fun block! Your step by step instructions are great. Such a cute block. Thanks for the press n seal tip! Thank for the great hint on how to apply the face. Love the block! Thanks for the opportunity to enter your wonderful giveaway! So cute! Love your block. Great hint with the Press n Seal. Thanks! How cute is that! Thanks for the press and seal trick info. Thank you!! You solved my problem of transferring stitching designs to small pieces of fabric! Your block is darling and the faces give them character. I love your block! They’re so sweet. I would never have thought of using the Press n Seal…what a great idea. Thanks. Oh, I love that Press and Seal trick! I use P&S in my quilting but had never thought about the possibilites for embroidery. Thanks for the tip. Awesome way to use Press N Seal. I will use this in the future and am so glad you posted it! What an adorable block. You did a beautiful job! Congratulations on being included in Issue 5. What’s really funny to me is that 2 yrs ago I really did not like Matryoshka’s at all but over the past year I have been liking them more and more so I’ll be glad to get my copy of this issue to check your block out more. I think it’s just such a cute one. Thank you. I love paper piecing and when I saw your stacking dolls I was hooked. As an ex-preschool teacher I would have loved to use this pattern in some of my story telling. I will be watching for a pattern and also the press and seal. I use Press N’ Seal all the time in the kitchen but would have never thought of it for a use like this; thanks for the tip! Thanks too for a chance to win a copy of this great issue! Thanks so much for the tutorial on your block. I really love how the “dress” highlights the fabrics. Very cute block. i will be using it on my great niece’s next quilt. Thanks for the chance to win the magazine. 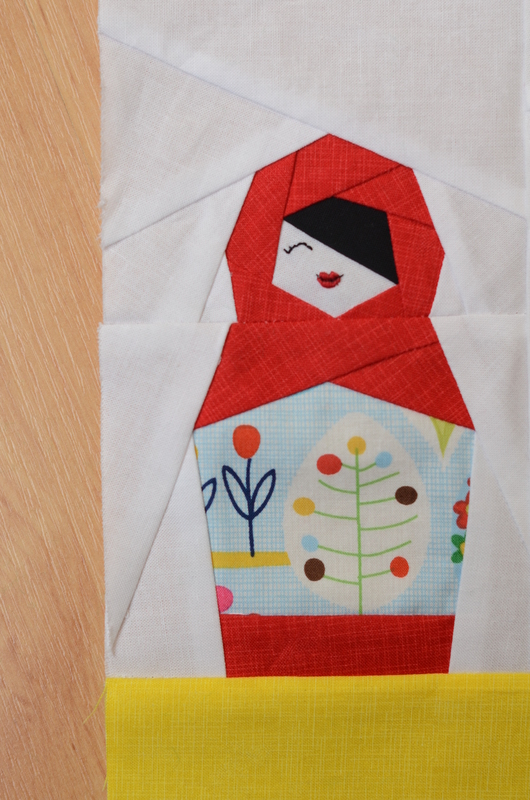 Thank you for the great block and tutorial…this will make a great gift for my sister as a pillow – we both love Matryoshkas…but her collection is bigger than mine…I might have to work on that! I’d love to win the magazine to inspire her to do more quilting…my collection of fabric is definitely bigger than hers! Those are seriously adorable and clever! love the dolls. of course i would have to get out my cindrella fabrics and PLAY!!! 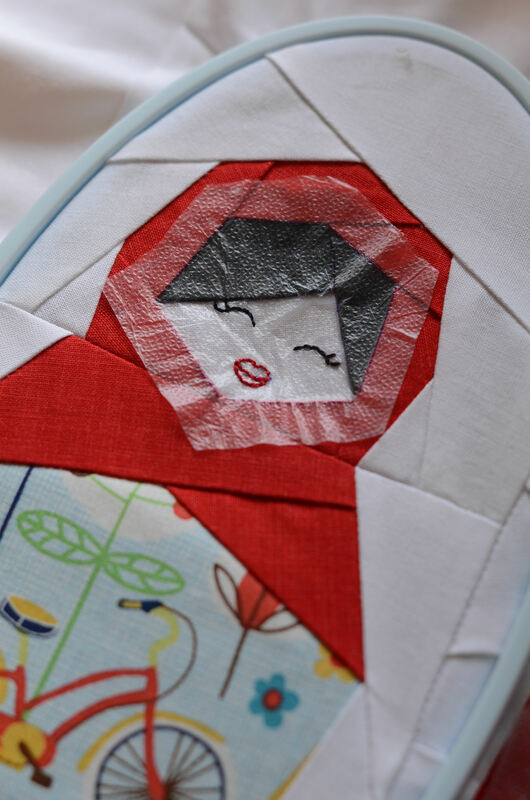 Love the Matryoshkas, found a pinchusion pattern at Riley Blake’s Cutting College this weekend, I definetly see some dolls being made soon! Thank you for a great pattern and the tip about using Press & Seal for the embroidery!!!! What a great tip about using the Glad Press & Seal. Thnx for sharing! Your blocks are so unique and a great way to use some I spy fussy cuts. Great tip regarding the press and seal too. I hope I can rememeber it when I need it. Darling block! I think I’ll have to make this one! Wow, what a lovely block and thanks for sharing this new to me method. You have the cutest block. What a clever idea to have using the Glad Press N Seal and sharing with us. I just love that product and I was a demo person for Wal Mart to demonstrate the use of Glad Press N Seal when it was first introduced. Thank you for participating in the Quiltmaker’s 100 Block Volume 5 Blog Tour and giving us all a chance to win such a great book. These are the cutest dolls! Thanks for the tip on using press and seal wrap for the embroidery. I would enjoy winning a copy of v5 QM 100 blocks too! 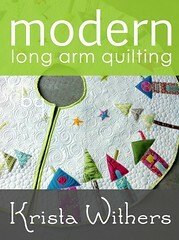 My long-arming friend uses press & seal to audition quilting designs. Such a versatile tool! Very cute!! Great suggestion for tracing! I love your block! Thanks for sharing and Congratulations! These are so cute!! That was a great tip using the press n’ seal. I’ll try to remember it. 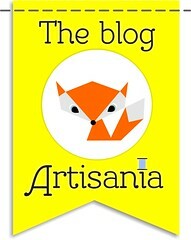 I am looking forward to viewing the rest of your blog! 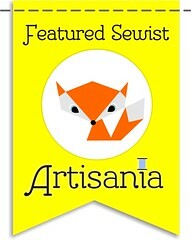 I love your ‘Lil Matryoshka block and was glad to learn about Glad Press and Seal. 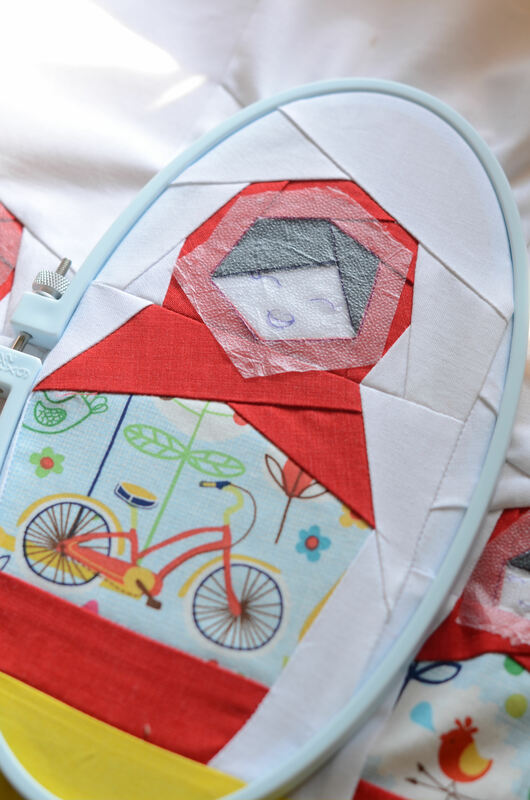 My daughter collects Maytroscka dolls(probably didn’t spell that correctly); and I love your block – but even more the great idea of using Press ‘N Seal to transfer embroidery or even quilting patterns – thank you so much!! Your nesting dolls are adorable. I’m a paper-piecing fan too. Your block is ADORABLE!!! I have always wanted to try the press n seal and this is a great block to try it on. Thanks! Had never thought about the “Press and Seal” for embroidery before. Thanks for the tip. Great block too. Cute block! The teenage one looks like my granddaughter who is about to graduate high school. I love the faces, they are so adorable. I will have to try the press n seal, that is a wonderful idea. Thanks!! It is adorable! Thanks for the Press & Seal tip! Congratulations to you on a great block! I love the sweet little family! Oh, what a cute, cute block. I’ve always loved those Russian dolls within dolls within dolls. Your cute little family reminds me so much of them. Congratulations on your great block and thanks for sharing! Wow – love the press n seal tip – would never have thought of that. Thank you for sharing. I will definitely be using press n seal for adding details. I would love a copy of this magazine. So much inspiration with the different blocks. Great embroidery tips! Can’t wait to share with my mother. Love the block and the fabrics chosen. So fun! I love the block. I will have to try it in a quilt for the Granddaughters. Using press and seal is a great tip. Thank you. I LOVE your block!! I have yet to try paper piecing, but it is for sure on my list. Thanks so much for the great information and the chance to win. Thanks for the instructions on how you did the embroidery. Very cool! Just when you think every tip has been out there, here comes yours about Press N Seal! Too cool! The blocks pretty cute too! Thanks! Great block. Loved the way you used the Glad Press and Seal. I don’t use the roll in my kitchen much, guess I need to move it upstairs to the sewing room. I love your creativity with these dolls. I think I’ll make a wall hanging for my granddaughter, a girl can’t have too many dolls! Great block! I follow your blog! Very pretty block and unusual. Thanks for the press and seal tip. Such a sweet block. And what an interesting way to get the pattern on to your project. thanks for sharing that info with us. Congrats! I love your pattern…those dolls are adorable! Such sweet little faces on your ladies. Love the pieced block. Thanks for sharing. Thanks for the great idea on the placement of the faces. It’s so much fun to share what we know. what a sweet block. Thanks for the tip on the embroidery using press and seal. What a cute idea. ove the dolls. Love your Tute on how to make your pattern. Press n Seal works on lots of stuff!. Thanks for the tutorial on the embroidery. Useful for the future–and for the sweet, sweet block. I never heard of that press and seal stuff! Sounds like something to try! What an adorable block! I love the press and Seal tip too. Thank you! And thanks for the chance too! So cute! My aunt had little dolls that stacked inside one another. They were so fun to play with! Love your block and the tip about Glad Press N Seal! Thanks! Another way to use Glad Press and Seal. Wonder if anyone actually uses it for food! wow what a great tip that press and seal. Thank you. What a cute block! I have a set of the nested dolls that a former neighbor brought us from Russia and I have always really liked them. Great idea for the embroidery on the face. Oh! Oh! Its so cute! I hope i win, so i can use your little tutorial to make such sweet faces on mine!! An adorable block. Thank you! My great-niece is one-half Russian and I am sure to use this block in a quilt for her. It’s the best block I’ve seen so far! Thanks for the opportunity to win–pick me! Pick me! I love your block and the fabrics you chose. Would love to win! Wow I found the “press & seal” tip to be quite helpful and will be using in the near future. Thank you for your kindness for the chance to win. Congrats on the publishing of your block. How cute are they! This is a fun tour. Great block and like the tip for using press and seal in it. Your block is really cute. Congratulations on having it featured in Volume 5! Thanks so much for the tip about press and seal and for the giveaway. Your block is just so adorable. Thank you for the photo details showing the steps you took in making it so well. I love this block…such cute girls! Thanks for the tip about the press and seal. What a darling block! Please enter me in the giveaway. Congrats on being on the COVER of the magazine! What a cute block it is and the endless possibilities….! Thanks for the giveaway! Super Cute! Thanks for the little tutorial as well 😀 My DD will love this block for sure. Very cool block. I love the tip about the Press n Seal…thanks for sharing. Love your blocks and would love a copy of 100 blocks volume 5! Your block is really cute but the detail of the embroidery is really amazing! When I try to do embroidery stitches it looks like a 3 yr. old did it! Never knew to use Press ‘n Seal to stitch by hand through but it makes sense, I have known people to quilt by machine through it ( with the designs drawn upon it). Great block! I love your block! And I know just who I would make it for as a gift. Have a friend who collects the nexting dolls and this would be perfect for her. Thanks! Cute block! Makes me think of nesting dolls. Congratulations on having your block in the Magazine…I love the block..very cute. Absolutely adorable block. I really appreciate the info on how to use the Press’n Seal. I mostly just improvise and am not always that happy with the result. Thank you. Love your block! I love to paper piece. Thanks for the tip on embroidering the faces. I already have the Glad wrap! Love your block. I have recently become a collector of “Russian Nesting Dolls”. Thank you for the details on how to make the faces. Congratulations on being in Vol. 5. How adorable!! Thanks for an opportunity to win! What a great idea- learn something new every day! I love your tip about the Press n Seal! I do a lot of embroidery and have not heard about it. I enjoy paper piecing and really like your block! Congrats on being in the book!! These little faces are priceless. Thanks so uch for the great tip and wonderful block! LOVE your block, and the simplicity of adding the beautiful faces! I have a few sets of the nesting dolls, and am so happy to see this block! Would LOVE to make one soon! Congrats on being chosen for the Quiltmaker 100 blocks! Oooh! They’re such cuties! I would love to make them. This block is just such a delight. And I have a roll of Press Seal that I was never sure exactly sure how to use…. Perfect. Thank you. Awesome block, very creative. 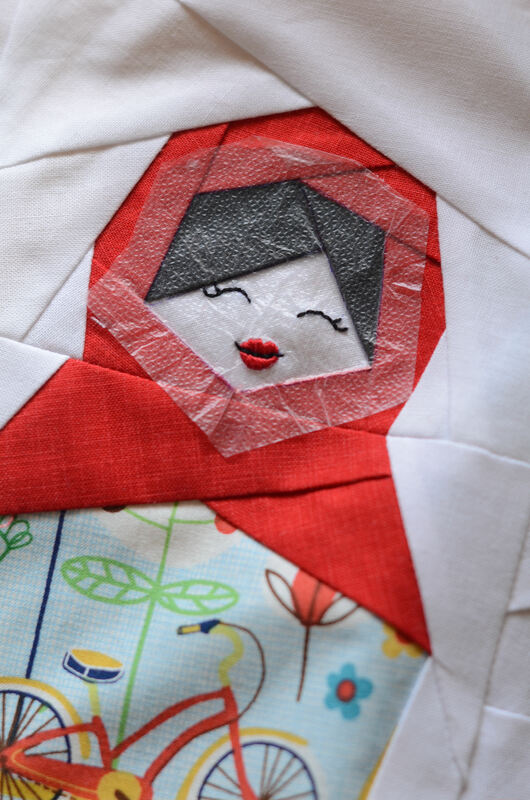 Congrats for your entry in the new Quiltmaker’s 100 Blocks book. Congratulations on your block in the ‘100’. I have used the press n seal for FMQ but never for the embroidery – thank you for shring. Gasp! What wonderfully adorable matroyshkas! Fabulous design; it is well deserved to win a spot in this volume! Oh my, I must buy the new issue now, my mother in law will just die if I make her a wall hanging with a doll to represent each grandchild!!! It will be so much fun to embellish to represent each of the children! OMGosh! those little girls are adorable! Love your embroidery work on them. The lips are gorgeous. I love using Press N Seal for leftovers. Who knew that it would be great for crafting, too! Very cute block! I love Matryoshka dolls. Thanks for the tip about Press N Seal too. What a darling block! Congratulations for being in Quiltmaker’s 100 Blocks! I have not paper pieced alot but would love to get better. I love the tip with the Glad Press & Seal. I do alot of embroidery and this is a great tip! I had no idea Glad Press n Seal could be used for embroidery!! Thanks! This is one of the cutest blocks I have ever seen! I love to paper piece so this definitely goes on my project list! Thanks so much. I love anything Mastryoshka. They are so sweet. Definitely need this book. Fantastic.Thanks for sharing your tips.I love paper piecing blocks and love the tip you give.I`ll try it.Thanks! Adorable block! That press and seal idea for embroidery is perfect! Thanks for sharing it. This blocks looks like it took some time to create! Cute block. I love paper piecing! Oh. My. Goodness. Glad Press & Seal – greatest idea ever!! I have a huge quilt that requires embroidery and I dreaded marking!! Thank you! I also visited the Ukraine a couple years ago and will capture that trip with this block! Thanks – and I’ll be back to read more. Keep up the inspiration. ummmm. one more reason to buy press and seal! I’m glad to see that the word is getting out about the multi-uses for Glad Press N Seal. I’ve been spreading the word for months now. It’s the best thing for hand quilting, and now embroidery. Thanks for sharing your wonderful block. I love paper piecing. I love your block and how you used the press & seal! I do a lot of embroidery and never thought about using the press & seal, thanks for sharing your creations, they are wonderful. This is such a cute block! Love your block! 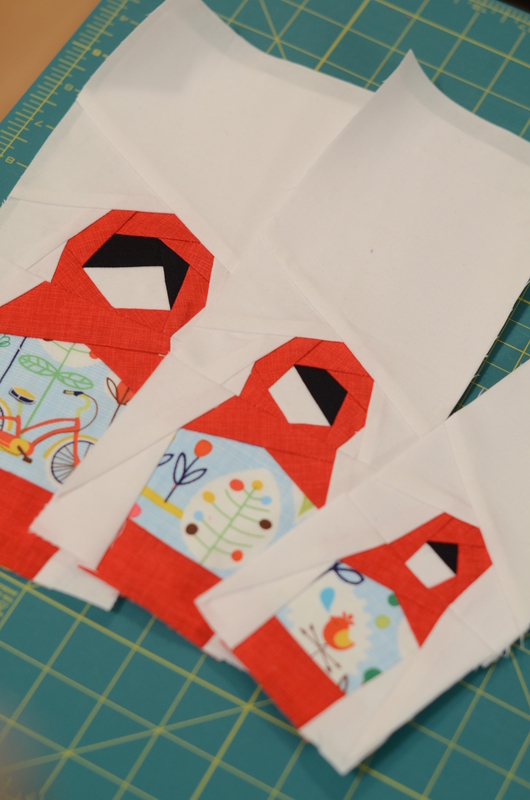 I am also a huge fan of Glad Press N Seal – I’ve used it to demo machine quilting designs. I loved the dolls. They are so cute. And with the larger tummy area to feature fabric you could make them for any event or culture. Would love to win the book. So excited about this block! 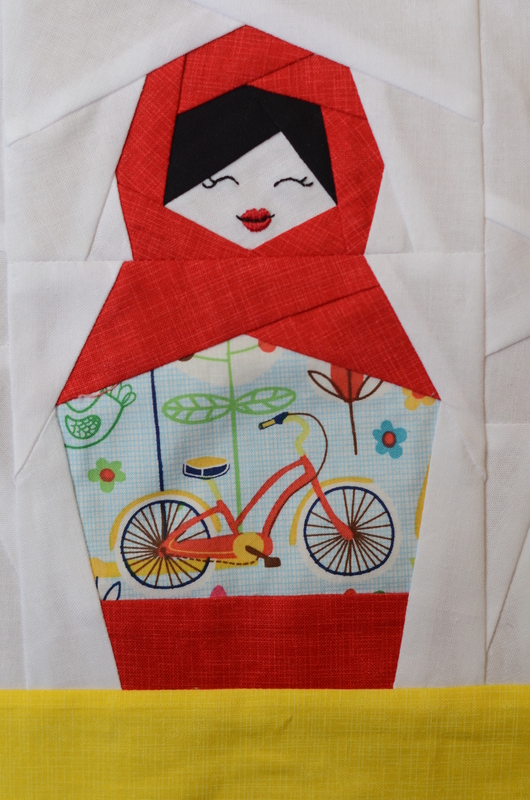 I hope I win a copy of the book so I can make this into a quilt for my young niece who adores matroyshka. I am a new quilter and have just discovered paper piecing. I love this block! I have also joined a local club called Possibilities which is a group of quilter sharing any new tips, tricks, or rulers that they have discovered. Each person takes a turn at sharing their new ideas and all year I have been sitting there thinking “what on earth can I show these ladies that they don’t already know”….Glad Press N’ Seal!!!! Thank you so much for that tip…and the crazy thing is that I have some in my cupboard right now. Love this block, awesome tip. Thanks for the chance to win. Never heard of using press and seal. Thanks for the tip! A charming block! Excellent work on the piecing and the embroidery. Thanks for the hint about using plastic wrap to transfer markings. A charming block! Excellent work. Thanks for the tip about transferring markings using the plastic seal wrap. Amazing block – I can see it done in so many fabrics and look different but sooo good! Thanks for the chance ot win a copy!!! Fingers crossed for me! 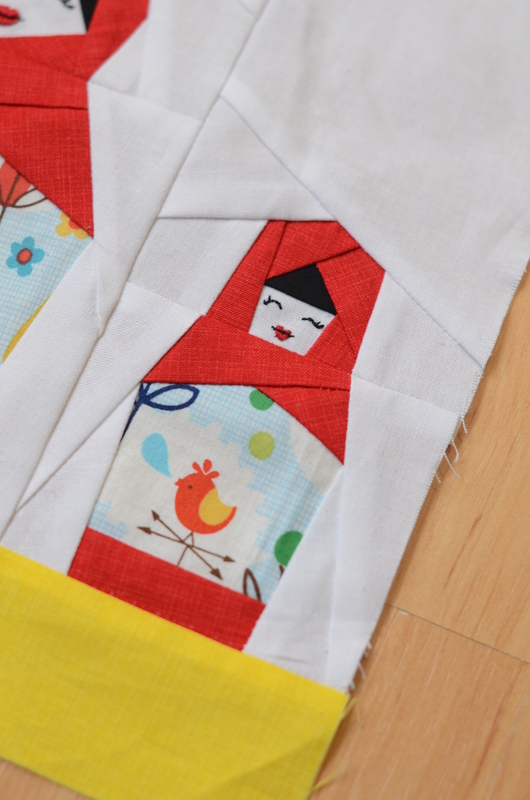 Your block is just adorable, and I so love paper piecing! I also love your tip about using Glad Press and Seal – isn’t it great how we can use so many household items in our quilting? Congrats on having your block selected for inclusion in Volume 5! I’m new at quilting and you’ve shown me some new and creative ways to quilt! Thank you! Adorable! And thanks for the tip on using the Glad Press n’ Seal. And congratulations on having a block published in the new edition. Your block is so fresh and cute. What a whimsical pattern. I appreciate the detail instructions with the photos on how you embroidery the faces. Love these little dolls! They remind me of my grandma. Oh , I just love your block, thanks so much for sharing. Love the tutorial as well. Lovely, whimsical block. Love the embroidery technique. Love your block. One I would like to try. Also thanks for the tip on using the Glad and press. I have some here but have never used it for embroidery. Good new technique to try. Wow! I love your block!! and thanks for the tip re pressnseal!! New Quilter here! Looks and sounds exciting! Love the idea of using Press and Seal for embroidery. And, I love your block and choice of fabric. Thanks for the tip on the press and seal; I would have never thought of that one. They are just to darn cute!!! Can hardly wait until I get my copy!! Thanks for adding the tutorial. Nice blocks! Your block is adorable! Thanks for the Press ‘N Seal trick. That is very clever! What and interesting way to complete a block and the design is wonderfull. What a great hint, using the Glad Press n Seal — I’m definitely going to give that a try. …and your block looks perfect for my granddaughters. That is the best tip ever! That would work for applique too! Thanks for a chance to win. Your block is AWESOME, especially the personalization. And thanks so much for the helpful tips – I’m going to try the press & seal next time. Thanks for sharing the press n seal idea! I would love to win a copy of this book. Your block is adorable. 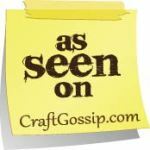 Love the Press and Seal tip – thanks! Your block is just darling! The press n seal idea is great! I will definitely try it. I also would love to win! That is way too cute, you must be very excited to be in this book and many thanks for the giveaway. I am so impressed with your work! Adore it! I am new to blogging and need to figure out how to manage finding the blogs. I must read your archives. Thanks! Autumn. What a great tip with the Press and Seal! Thanks for the giveaway. What a clever design, thank you. Congratulations in being included in the book. designs. Thanks for the inspiration. OMG – these are the cutest dolls yet! 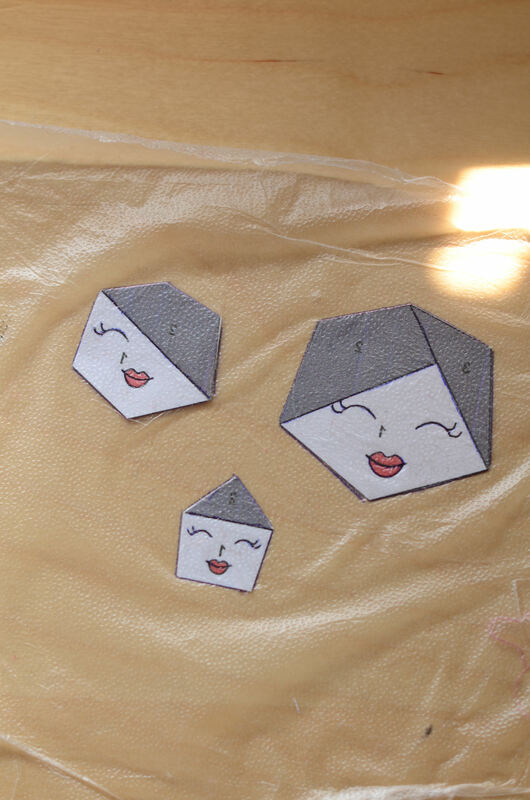 It really makes me want to try paper piecing for the first time – your directions make it look like I could to this! Thanks for the give away! Congrats on making the book. Real adorable little dolls. Complimenti e grazie per la condivisione del tuo ricamo. Posso partecipare al sorteggio anche se vivo in Italia? Un abbraccio. Oh I LOVE your block! It is so, so cute!!! Thanks for the tutorial on using the Press & Seal – great idea! Congratulations on having your block in the volume. It’s beautiful. I love your block!! I have been collecting oriental fabrics for quite a while and am planning on making a quilt with it. I think your block might be my center block. It’s beautiful!! 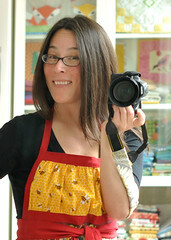 Enjoyed your Blog and congrats on being featured in Quiltmaker’s 100 Block magazine. I have all the other books and plan to get this one also. Congrats on not only your block being included in the issue, but also you’re a covergirl! Congrats! Love, love your block! Thank you for sharing the tips on how to do the embroidery… and congratulations for having your block published in the issue. Love your block…soooo cute!! I am SO IN LOVE with your block, Sonja! Your block it the #1 reason I’ll be buying this issue! Great block. I love embroidery. Comments Closed! Off to pick a winner! – Good luck everyone!